Software really isn’t my life. It is a tool, a means to an end. I want to make a print of a holiday picture, or type a recommendation letter for my realtor. Truly, there is a long list of things I’d rather be doing than exploring a software program. The same is true for my work life. Although software tools have become an integral part of a technical writer’s job, they aren’t the focus. At least, they really shouldn’t be. If I want to format text and capture and organize thoughts, I shouldn’t have to dig into Visual Basic or .NET to write and produce a document. Similarly, in your SAP life, sometimes you just need people to enter data. You don’t want workers to know how to use every Tcode ever invented. That’s how Winshuttle Runner can help. 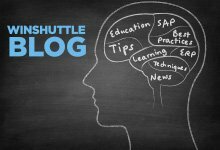 Winshuttle Runner presents a friendly face for SAP processes. In fact, users can access SAP business processes without ever needing to open the SAP interface and without even having to have a detailed knowledge of those processes. They don’t even need to leave their Excel spreadsheets. That’s pretty useful…all of us have more important things to do than learn everything there is to know about software.